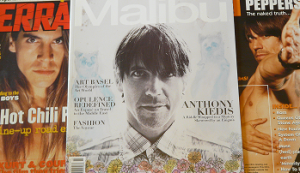 Welcome to the biggest online collection of magazine scans dedicated to Anthony Kiedis himself! These scans are for other fans to enjoy. Many of the magazines are from my personal collection which I’m sharing with other fans to give something back to the AK/RHCP community. They are not a free Instagram resource just to be taken and passed off as your own. Please respect the time, effort and massive cost it has taken to collect and upload them- I don’t have to share them and do so out of good will. It has cost a lot of time, effort and money to collect & upload these scans and I’d like fans to be able to see them properly, in full and with a transcript rather than a inferior copy, so please either leave the site logo, or add a link back to this website, and then people can view the original scans and transcripts in full and any questions can be answered. I don’t mind people sharing the images if they are respectful and don’t just take them to use elsewhere as their own. Please do not crop to remove the site logo (due to issues on Instagram, some of the scans of expensive/rare magazines are currently shown only as thumbnails- not a decision I took lightly, but I was forced into it by rudeness and arrogance). I am happy to email full scans to fans who want them for personal use. Many thanks to everyone who has taken time to copy and kindly donate scans of magazines in the their own collections. The criteria for inclusion here is that Anthony Kiedis is on the cover, the interview features just him or he has a prominent part in an interview (text or photos) of the Red Hot Chili Peppers as a whole. Please note that this is just a small section of the back issue magazines featuring RHCP that I have online as only those featuring AK heavily are featured here. I currently have about 500 back issue magazine articles featuring RHCP scanned and online over my two websites. (All English language articles now have a transcript). If you have any magazines/scans you’d like to share, I’d love to hear from you! Also any help translating articles into English would be very much appreciated.